Watch the 2018 STAR and RISING STAR winners announced here. 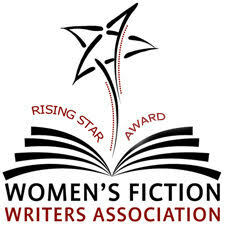 If you are an editor or literary agent and interested in any of these manuscripts, please email the RISING STAR Award chair, MM Finck, at [email protected]. Love You Better by Rachel Berros is about one woman who abandons her family for her children’s benefit, and another who says goodbye to the man she loves so they can both fulfill their dreams. When a postcard entwines their lives, the women discover how change can help them fulfill their hearts’ desires without abandoning their goals. In What Comes After Four by Miranda Darrow, West German pairs skater Claudia Wolff came to the 1988 Winter Olympics in Calgary to skate for gold, for adventure, and possibly a first romantic fling. She didn’t come to fall in love with an East German skier. If their relationship stands a chance, Claudia will have to face her family, the consequences of her choices, her greatest fears, and the Berlin Wall. Having trouble bouncing back after a disastrous divorce, in the book Looking for Darcy by Ginny Elkin, Anna's family convinces her to travel to England, to uncover her grandfather's mysterious past. She finds secrets larger than she anticipated, as well as meeting two very different and intriguing men. Anna must decide if she is willing to trust herself and take a chance, having gained knowledge and power on her journey. Lynne Frank just wants to go home already. Being dragged from the suburbs of Boston to the wilds of her husband’s West Australian hometown has only inflamed her fear of flying, crocodiles, and being judged a bad mother. When she wakes up to her mother-in-law’s plan to keep her son Down Under long-term, Lynne must forge a path through her own fear - embracing unlikely allies and dodging cockatoos - while she struggles with the meaning of the word home. Angel Falls by Shelby Riley is about three adult sisters, tricked into returning home by their dysfunctional mother, who find themselves drowning in the past. When they realize their mother’s using the claim of death, and her subsequent request for a mercy killing, to manipulate them, they are forced to make sense of their family roles and must go to great lengths to break free from the dysfunction, while still remaining connected as a family. Winner will be announced September 28, 2018 at the Annual WFWA Retreat in Albuquerque, NM. Further information about the RISING STAR Award can be found here. If you are a bookseller or librarian interested in any or all of these titles, please contact MM Finck, VP, Communications, at [email protected]. Two sisters on the coast of Maine are swept up in the dark underworld of the heroin highway. Their family’s past complicates the efforts of one sister to save a child who is the survivor of a drug crime. Coming of age in the 1930s, long before LGBTQ advocacy, Ruth Thompson risks dangerous social repercussions in order to live her authentic truth. The Winners will be announced at the annual WFWA Retreat in Albuquerque, New Mexico on September 28, 2018. The 2017 Star Award General Category winner is Carla Damron for The Stone Necklace. Damron lives in Columbia, South Carolina. Her book was published in January 2016. The 2017 Star Award Outstanding Debut Category winner is Marilyn Simon Rothstein for Lift and Separate. Simon Rothstein lives in Avon, CT, and her book was published in December 2016. The 2016 Star Award General Category winner is Scott Wilbanks for The Lemoncholy Life of Annie Aster. Wilbanks is an American living in Auckland, New Zealand. His book was published in August 2015. The 2016 Star Award Outstanding Debut Category winner is Kelli Estes for The Girl Who Wrote in Silk. Estes lives near Seattle, Washington, and her book was published in July 2015.